These darling flats are low and comfortable. They are cobalt blue in satin with a rounded toe. Material : Textile Man made materials. Heel Height: Flat. Color : Colbolt Blue. Satin upper and leather made. Beautiful classic bow in the front. Shoes are in pre-owned condition and show signs of light wear. Length (heel to toe)-10.25". Insoles-10.25". 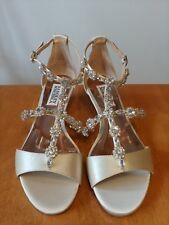 Beautiful jeweled ivory satin wedge sandals, new size 5.5. 1 3/8" wedge, insole measures 9". Please know your size and email with questions prior to buying, no returns accepted. Thank you! Badgley Mischka is a trademark of Badgley Mischka. Tjmmfabuys is not affiliated with Badgley Mischka. (Perfect for dress or casual wear, they are purple satin accented. inside of them). Great footwear for your next Red Hat Society event! with red satin and finished with a bow on the side. The sole is ridged for extra. It is in a very good condition. Size: 5 B. Fabric Content: Satin. Heel Height.75". Condition: Pre-owned. Slight Interior Residue. Wear on sole. Slight Exterior wear. Color : Multicolor,Yellow. 36, 36.5 3, 3.5 6, 6.5 36.5, 37 23.5, 24 8.75"-8.875". COLOR: Chocolate. MATERIAL: Satin upper, leather lining / leather sole. STYLE: elegant square toe low heels. CONDITION: gently used except one scrape on right toe. HEEL: 1.5 in. Slip-on Mule Kitten Heels. Gray Satin. Used but excellent condition. Worn 2 times. Beautiful beaded slides. Natural color satin with multi color beads. One inch heel. Size 7.5. Cushioned sole. In original box. Shoe travel bag included. The Shoe plastic display inserts are not included. THEY ARE KIND OF HEAVY, EACH ONE WEIGHS APPROX. Women's Satin Kitten Heel Pump Size 40 (EUR) in Champagne - Brand New In Box. Condition is New with box. Shipped with USPS Priority Mail. FOR SALE IS A PAIR OF YOU BY CROCS SHOES. Black satin upper. 3/4" High heel. Soft leather lining. NEW WITHOUT BOX. SIZE 7.5 M.
FOR SALE IS A PAIR OF COLE HAAN G SERIES SHOES. FINE SATIN UPPER. POINTY TOE AND BOW DECOR. 1" HIGH HEEL. NORMAL WEAR ONT THE EDGE OF THE HEEL. RUBBER SOLE. SOFT LEATHER LINING.